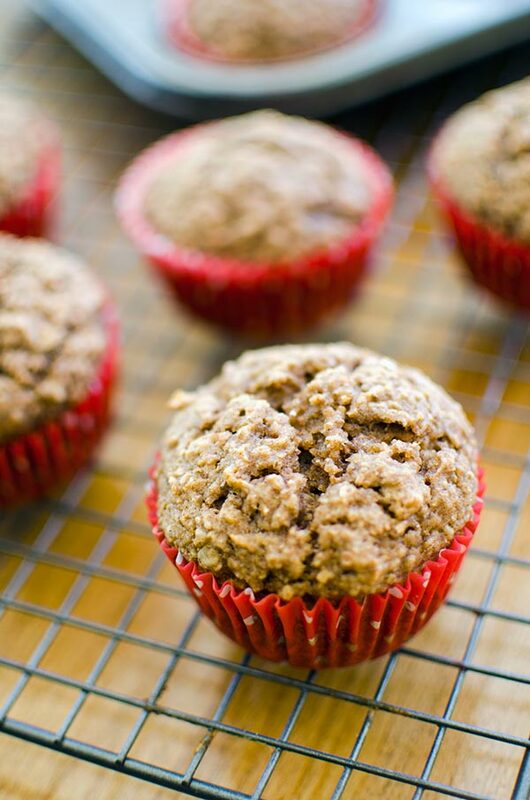 Whole wheat applesauce muffins use unsweetened applesauce for a healthy fall treat with oats, cinnamon this nut-free snack is perfect for lunch boxes. It’s been far too long since I shared a recipe for muffins on here. They used to be a staple of Living Lou in about 2011 and 2012, but since then I haven’t really created any muffin recipes. When I was brainstorming fall recipes, I knew that I wanted to create something with apples. After all, my baked apple French toast is still one of my favourite recipes I developed last year. These muffins use ingredients that you definitely already have in your kitchen which means you can whip them up right now for a quick treat (they are also a great snack to pack in lunch boxes or for an afternoon snack). There is just such a homely feel about muffins, I think they are probably the most simple and almost friendly kind of baked goods out there. Is it weird to think of homemade muffins as friendly? All of a sudden, this weekend felt like fall in Toronto, which means it’s the perfect time to post this apple muffin recipe. Once the fall, cool weather hits I find that I spend a ton more time in the kitchen. I love fall cooking and baking so much so that I tested and cooked six new recipes this weekend. It was definitely a wonderful weekend spent creating in the kitchen. The perfect way to de-stress and chill out after a busy week. 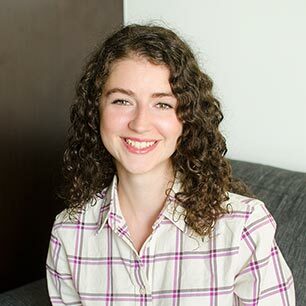 When I was working on this recipe there were a few choices I made, I decided not to include any walnuts or pecans because I wanted these to be something that kids could bring to school. I also made these mostly whole wheat, adding a hint of white flour and oats so that the muffins would be light and moist instead of dry and dense. Even with the unsweetened applesauce (when you’re baking, always use unsweetened applesauce so you can control the amount of sugar and sweetness in the recipe) the muffins still need a bit of fat to stop them from being dense hockey pucks, so these muffins have 1/4 cup of canola oil. As much as you can replace most of the fat in quick breads or muffins with fruit puree, I still find that a little bit of oil makes a huge difference. Even still, these muffins are definitely healthier than your average recipe. These whole wheat applesauce muffins have the beautifully cracked and domed top you expect in a muffin. With 1/2 cup of brown sugar, they also have a hint of sweetness, but not so much that they taste like a cupcake more so than a muffin. When I’m making muffins, I want them to be muffins not cupcakes, there is a serious difference! Preheat oven to 350F. Line a muffin tin with cupcake liners. In a large bowl, whole wheat flour with sugar, all purpose flour, quick oats, cinnamon, baking soda, salt, nutmeg and allspice. In a medium bowl, whisk applesauce with egg and canola oil. Stir wet ingredients into dry ingredients. Using a standard ice cream scoop, scoop mixture into muffin tin. Bake in centre of oven for 18-20 minutes. Let cool for 5 minutes in pan, then remove to wire rack and cool completely. 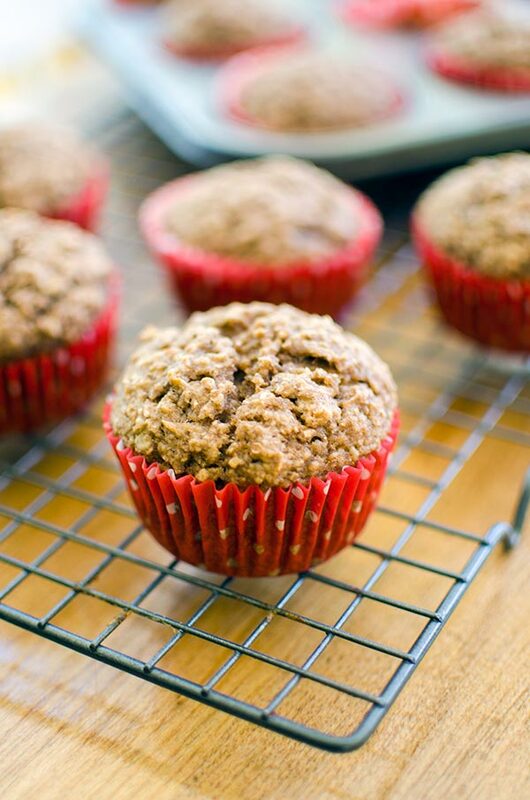 Let me know if you give these whole wheat applesauce muffins a try in the comments below. Another "healthy", easy to make muffin recipe! I am definitely going to be making this recipe! Hey Louisa those muffins look delicious and so easy to prepare. Awesome!